The evening open meeting didn't have as many entries as June, but still produced some good action. Results are available on the Results 2014 page. Videos of the 400m and 1 mile races are being loaded. Tonbridge placed 6th in the match and now have a massive challenge to avoid relegation from this premier division. The team was severely weakened by numerous absentees. More details to follow. Results are on the Results 2014 page. It was good to see Toby Ralph back in action, whilst Stuart Brown looks like he has got back on form, with 800m and steeplechase pbs. 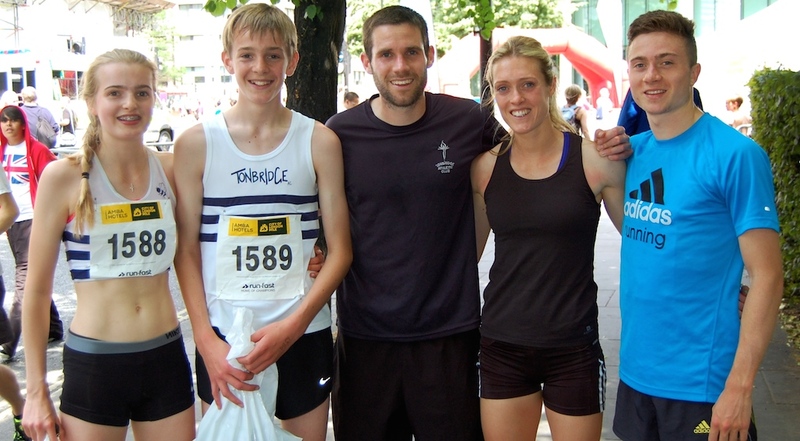 The Marsh family did the club proud with Nathan, Taz and Kiri all racing 3000 metres. Ashley Gibson placed 12th in the 5000 metres, in 16.29.12, not far away from her personal best, after a tactical and slow first half of the race. 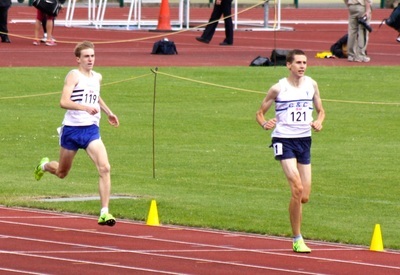 George Bourne placed second in a 10k road race at Aldershot on Sunday, running about 37.30. Mark Pitcairn-Knowles ran 40.03 for 3rd and Lucy Pitcairn-Knowles approximately 46 minutes. 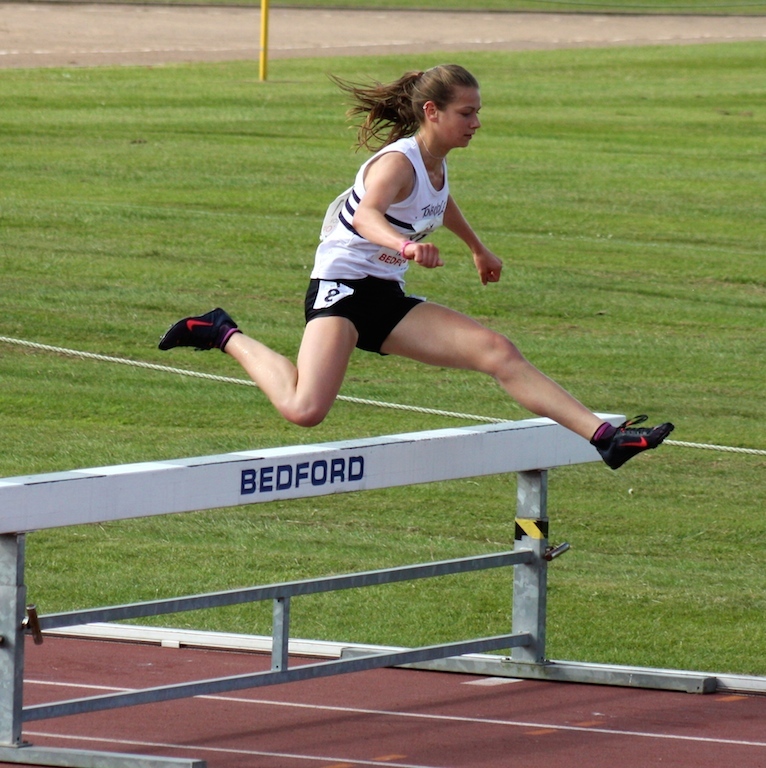 Nicole Taylor placed 10th in the 3000 metres steeplechase, in her first ever senior championships at this level. Nicole ran 10.53.64 and in the last thirty metres was overtaken by a couple of other athletes. Photos of Nicole and Robbie courtesy of Richard Owen. Full results of all Saturday's Parkruns are at http://www.parkrun.org.uk/results/firstfinishers/ .Dan Watt was first home at the Royal Tunbridge Wells event. Below is the latest table for the Tonbridge AC Grand Prix. Dan Schofield won the age graded this Saturday, but the Bradleys continue to pack the top 5, with Di having only completed 3 results compared to the 4 of the others!! Next qualifying race is next Saturday. 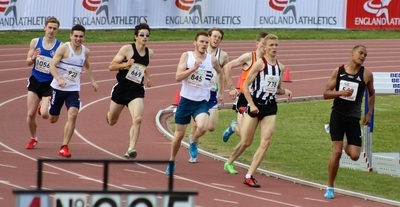 Sean Molloy had a very disappointing race in the 800 metre heat at Birmingham. Having had strong performances over the last two weeks, he hoped to have a chance of making Saturday's final, but it was not to be. He commented that he just did not feel himself and struggled home last in 1.55. TAC athletes set a number of personal bests at the meeting. Harry Paton kicked things off with a 400m pb of 56.8, followed by James West in the 800m with 1.53.18. At 1500m there were bests for Michael Ellis (4.15.75) and Catherine Symons (4.53.37), whilst Dan Watt reduced his 5000m time to 16.14.32. A summary of results is on the Results 2014 page. Sam Crick was first home in the 2k race, whilst Bede Pitcairn-Knowles led a TAC contingent home when finishing 9th in the 5k race. See Results 2014 page. For any under 15 and 17s who were disappointed not to be selected then there are other opportunities at the South of England and National Championships, which are still to come. Sean Molloy (800m) and Nicole Taylor (3000m steeplechase) came away from the championships with a bonze medal from the under 20 events. Sean had progressed nicely through the heats and semi finals on Saturday and in a close final on Sunday, was just 0.35 seconds away from the winner in 1.51.35. Nicole backed up her personal best from last weekend with a brave effort in 10.45.36, despite falling at one barrier towards the end. This was her first experience of a National age group championships at Bedford and like Sean, she is now due to race in the British championships next weekend. Tonbridge AC grabbed a very close, but vital third position in the match. This will give us a good chance of remaining in the Premier Division. There were some excellent personal bests, from the likes of Matilda Hall and Ben Errington. Summary on the Results 2014 page. Tonbridge finished second to Crawley in this third match of the season. Like TAC, Crawley had also won their first two matches. The standout run from a distance running point of view came from Ben Cole, who ran a personal best for 5000 metres of 15.15.6. Full results are on the Results 2014 page. I have managed to track down the results which are now on the Results 2014 page. 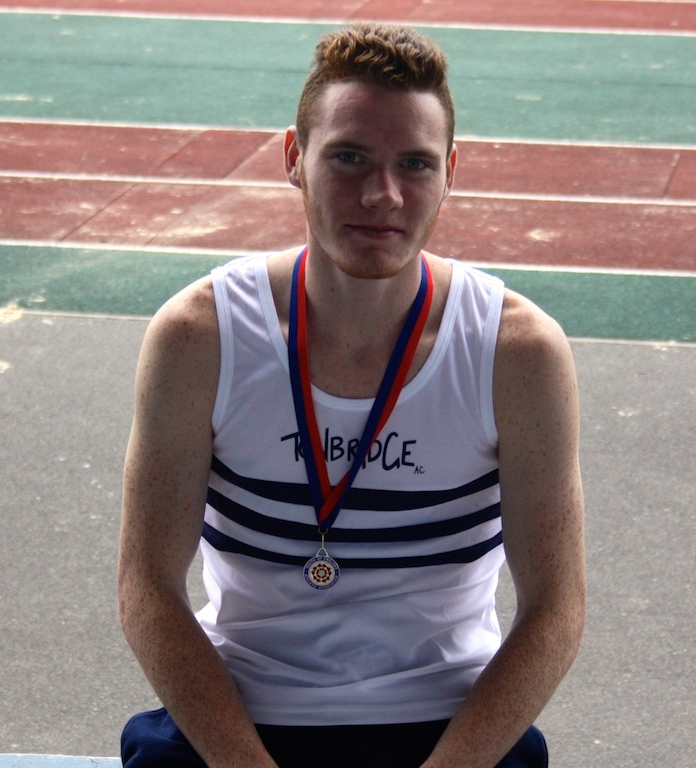 Jamie Goodge (3000m) was the only TAC winner on the day, but there were a number of 1500m personal bests from Kathleen Faes 4.40.4, Jesse Magorrian 4.17.8, Charlie Crick 4.20.6, James Puxty 4.23.9 and Alasdair Kinloch 4.08.4. 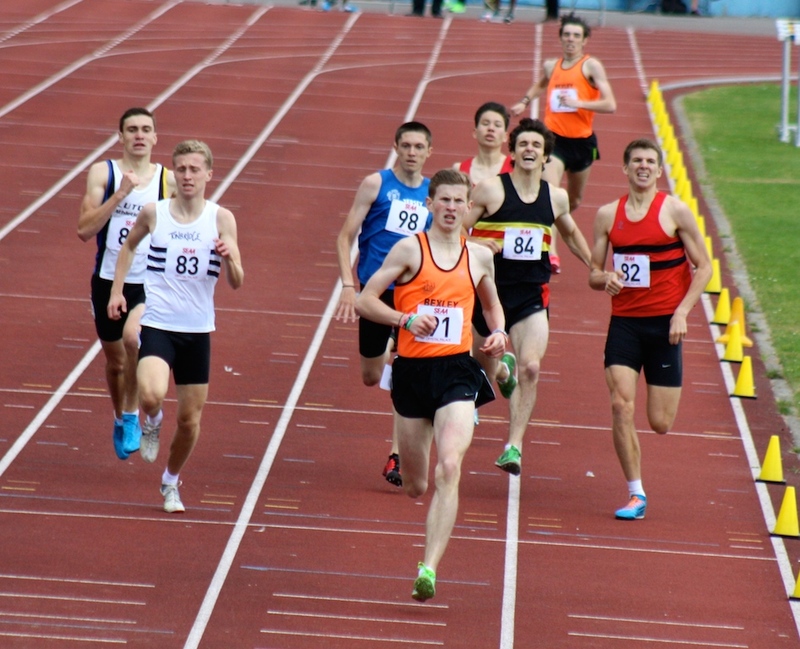 Perfect conditions greeted us at Watford, where the open meeting was based around a total of 24 x 800 metre races. In addition there was thirty minutes of British Milers Club Gold Standard races. TAC had seven athletes in action, who came away with four personal bests and two season's bests between them. First up was Ryan Driscoll in the BMC Mens B 1500m. Ryan had to dig deep on the last lap, but came away with a superb personal best of 3.52.63 to take four seconds from his previous best. 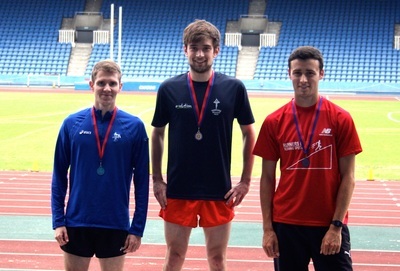 Steve Fennell ran in the BMC A race, having his first track competition of the season. He became TACs 13th athlete to go sub 4 minutes at 1500m this season (a record), in running 3.50.06. A tremendous weekend for TAC distance runners was capped off at Crystal Palace, with four more medals in the South of England Championships. 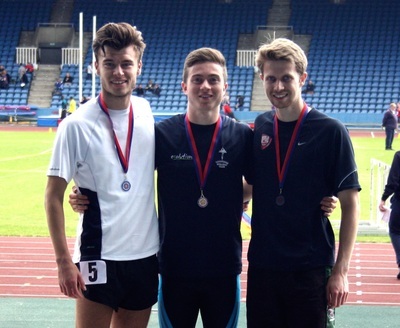 Robbie Farnham-Rose (800m) and Dominic Brown (1500m) both won gold medals in the senior events. 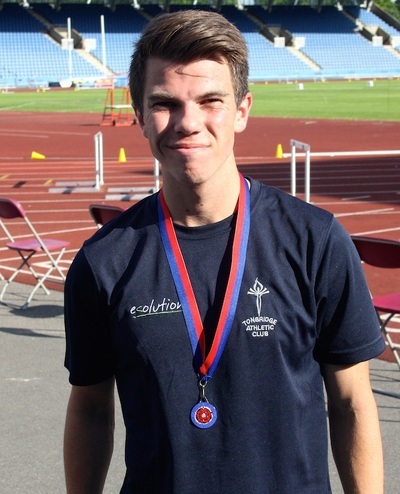 At under 20 level George Duggan won a silver medal at 800m in a closely fought race, whilst Sean Molloy surprised everyone with a silver at 400 metres, having looked out of it at halfway. Sean capped the weekend by running 48.88 to break Steve Fennell's TAC under 20 men's record. Unfortunately Max Nicholls took a fall at the British Mountain Racing, European Trials on Saturday. Max reports that he is ok, but had to pull out of the race, having been in contention when the fall happened. Joe Watts ran an excellent race at the Staplehurst 10k on Sunday in 39.28, reducing his pb by 90 seconds, to go sub 40 for the first time. Results were late being published for this meeting, but are now on the Results 2014 page. There were a few personal bests for TAC distance runners, including Matilda Hall and Abi Johnstone over 1200m, plus Ellie Cohen, Hamish Johnstone and Gideon Goldring over 1500m. 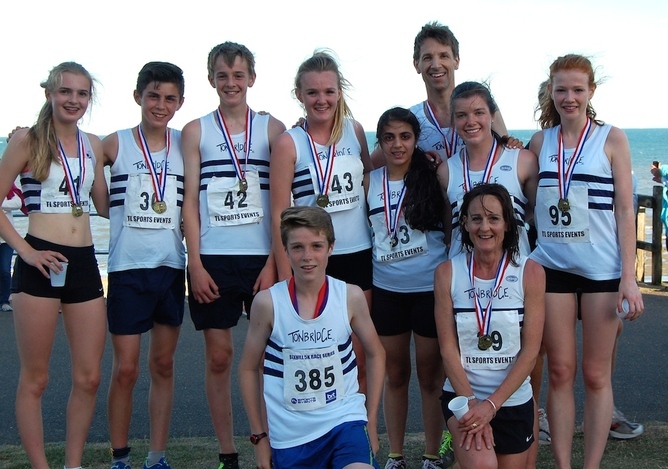 TAC distance runners picked up three medals on day 1 of the championships. Nicole Taylor ran 10.37.34 for 3000 metres steeplechase to set her 5th club record of the season and move upto 10th on the uk all time list in winning the gold medal. Lizzie Miller, James Kingston, Kathleen Faes, Chris Cohen, Alasdair Kinloch. Its really worth reading the Results Summary to see all the personal bests that were recorded. Christian Lee won the Surrey Schools, Junior Boys 800 metres title. 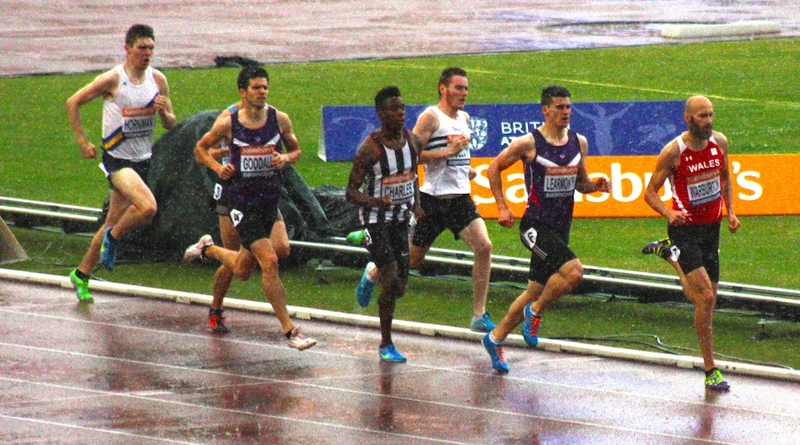 Dominic Brown won the 1500 metres B race in fine style in 3.51.26, which was a personal best by two seconds. A video of the race can be found at 2hours 49s into the following link http://www.vincosport.com/videos/8617 At the same meeting Corey De'Ath was disappointed with a 9.02.14 for 3000m. Joe Watts finished third and captured his first ever trophy, having joined TAC less than a couple of years ago. Joe ran the 8.6 kilometre trail run in 35.04. Nicole Taylor set her fourth club record of the season, from four steeplechases, when she lowered her 2000m best. 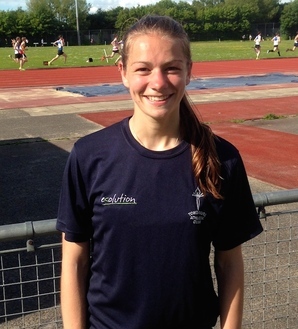 Nicole ran 6.51.88 to win and move into the UK all time top 10 under 20 women for the event. She is also the fastest in the UK so far this season. The other TAC athletes in action were Euan Nicholls (u17 1500m steeplechase 4.44.9), Kathleen Faes (u15 800m 2.18.37) and Ewan Wood (u13 800m 2.35.65). Photos below, courtesy of Richard Owen, of Euan and Nicole at the water jump. There were TAC runners at Tonbridge, Maidstone, Royal Tunbridge Wells, Tilgate and maybe others today. Summary of results is on the Results 2014 page. There were 9 TAC distance runners with 5 personal bests. Ryan Driscoll, Alex Howard, Charlie Crick and Sam Avis all ran pbs at 1500m, whilst Jamie Goodge improved his 3000m time. It was also good to see Corey De'Ath and Henry Pearce back to racing well. Full results and a summary are on the Results 2014 page. It was one of the most popular open meets TAC has put on eg 108 athletes in the 800s. It was good to see so many personal bests being run. Over 800m the biggest improvements came from Ella KingPowrie, Abianne Coates, Jess O'Hara and Abi Johnstone. 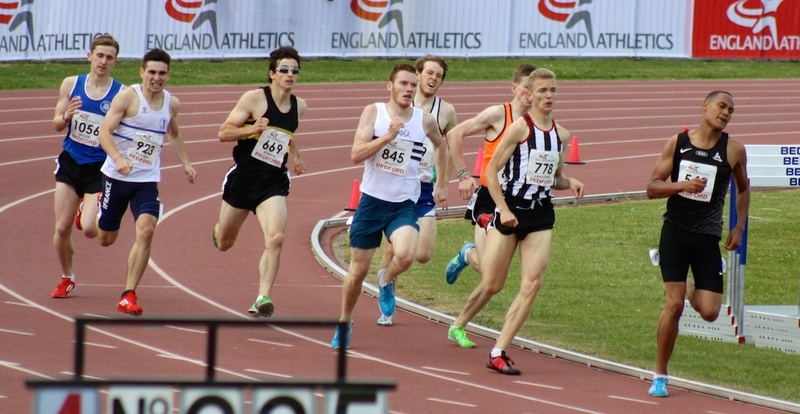 Brian Buckwell who is in the over 60 men's age group ran 800m in 2.32.25, whilst James West successfully completed a racing/training challenge with 400m 51.28, 800m 1.57.57 and 200m in 24.83. 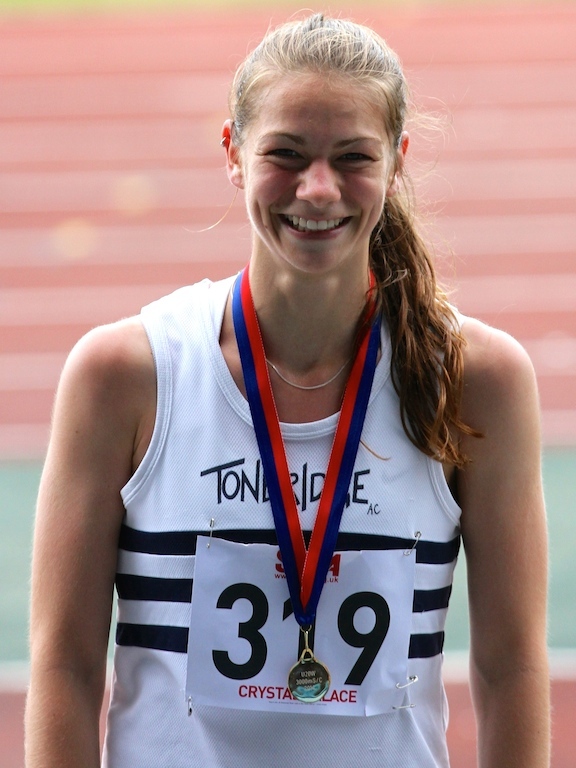 Nicole Taylor moved from 11th to 4th on the UK all time 1500m steeplechase rankings with 4.59.94. Alasdair Kinloch dipped below 9 minutes in winning the 3000m, Miles Weatherseed ran a pb of 1.56.44, Alice Ralph set a 1500m pb of 4.53.92. Richard Westover ran a new personal best of 79.20 at the Outlaw Half Marathon, near Nottingham on Sunday. Richard is mainly a triathlete and took 19 seconds from his personal best. The National Dinner and Awards will be held at Salomons Conference Centre, near Southborough/Tunbridge Wells on the evening of 21st February. Price £25 per person. Three course meal, National team photos, awards and dancing ! All welcome.